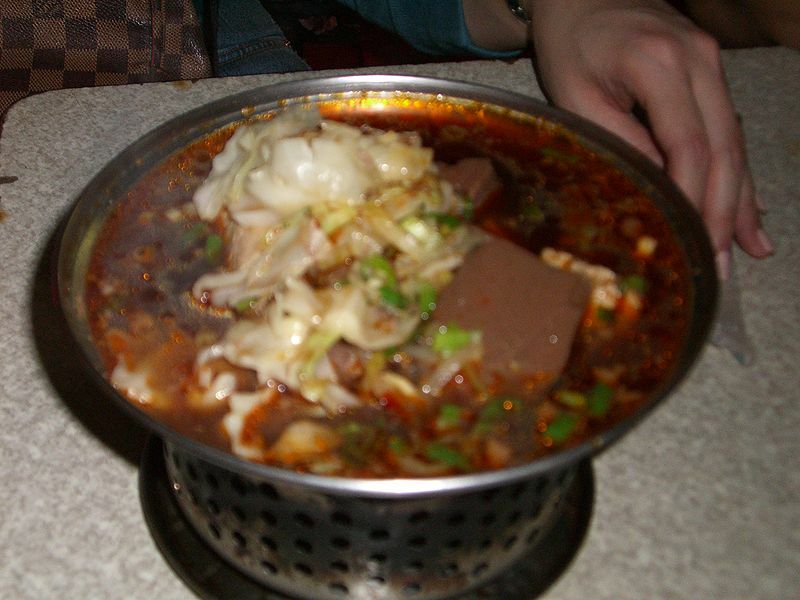 Sìchuān málà, more commonly referred to as mala sauce, is a popular Chinese oily spicy sauce which originated in the Sichuan Province of central China. It has become one of the most common seasonings in Chinese cuisine, gaining popularity anywhere where there are large populations of Chinese. Left: Stinky tofu with goose blood and mala sauce. The term málà is a combination of two Chinese characters: "numbing" and "hot (piquant)", referring to the feeling in the mouth after eating the sauce. The sauce is used in a variety of ways, from stir-fry, stews, and soup, to being used in hot pot or as a dipping sauce. In the Sichuan and Yunnan provinces mala powder is used on snacks and street foods, such as stinky tofu, fried potatoes, and barbecued meats and vegetables. Variations also exist that also include shacha sauce, MSG, and ginger. These ingredients are then combined with a large amount of oil and slowly simmered for approximately 10 minutes. The result is then jarred and used. Due to the effort required in making the sauce, many Asian grocery stores sell prepared mala sauce, which is available in glass jars and plastic containers.